Vegan Pizza Cheese Sauce. We made a new vegan cheese sauce!! This time it’s a pizza cheese sauce. This vegan pizza cheese sauce it seriously good! It has all the flavors of a pizza. It would make a great dip too. I also think it would be great as a sauce for homemade pizzas. Just add your veggies on top. There are already plans to use it in future recipes. You guys have to try this one! I know this sauce doesn’t look like much in the photo, but I promise it’s really good and flavorful! 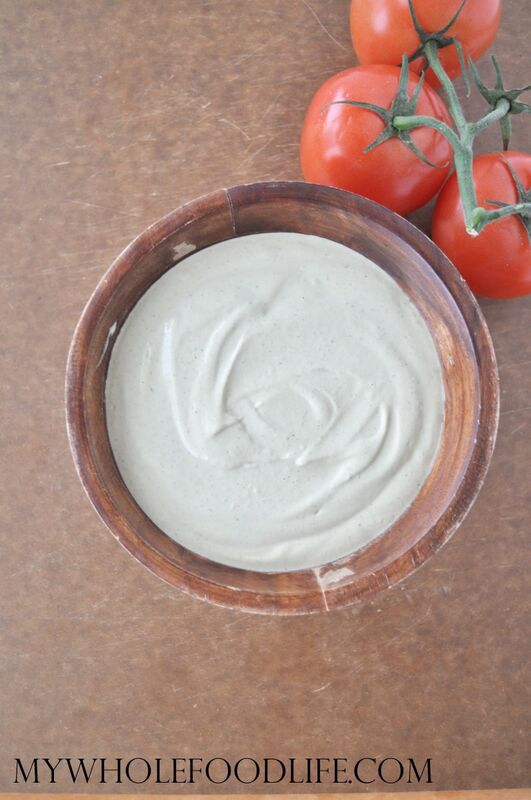 This dairy free cheese sauce is great for vegans or those with milk allergies. It’s also gluten free. You will never miss the cheese with this flavorful sauce!! Drain and rinse the cashews. In a blender , combine all the ingredients and mix until smooth. This sauce will keep in the fridge for a couple weeks. You can also freeze it for longer storage. Enjoy! This sounds really yummy! I love all the spices you have listed so I'm sure the flavor is spot on. Can't wait to try it!! Thanks! It tasted sooo much like pizza! It sounds wonderful!! This would work for creamy salad dressing, in potato salad, as a spread for sandwiches, veggie dip, etc. Can't wait to try it!! why do u need nutritional yeast? can u just not use it? or is there a substitute? So why is your sauce not yellow? My nutritional yeast is so yellow. I would like to find one that isn't b/c that means it has synthetic folic acid and such. Thanks in advance, Mellissa!! I think it is just the lighting the photo was taken in. Also, the nutritional yeast we use is yellow, but it was not enough to change the color of the cashews. I have never seen a nutritional yeast that wasn't yellow. Two brands of nutritional yeast that don’t contain synthetic folic acid: KAL Unfortified Yeast Flakes and Dr. Fuhrman’s Nutritional Yeast. This is all new information to me. Can you point me to an article I can read more about it? I would love to try this recipe. Where in Niagara Falls can I purchase nutritional yeast from? At any health food store. What perfect timing! I just received a wheat-free pizza crust mix today. I will soak some cashews in water tonight and have a yummy pizza tomorrow for dinner. I can't wait to try this recipe. Your book just arrived on my Kindle, too, so that will be fun reading. I can't thank you enough for all your fabulous, healthy recipes! Thanks Mary! I hope you enjoy the book too! Would love to know carb count of your recipes. They look so good but I am counting carbs to lose weight and I can have good carbs but need to count. I am sorry, I don't know. I think you can plug recipes into My Fitness Pal to get a rough estimate though. Is it ok to soak the cashews in stainless steel? Probably. I usually soak in a large mason jar. Can u soak cashews quickly? I can never remember the over night thing! I have heard you can do a quick boil for about 20 minutes. I have not tried it personally though. I am not sure another nut will work. Maybe try Brazil nuts or macadamias? How did you use this recipe? As a dip? If so, what paired with it well? Do the cashews have to be raw? Does that make a difference? I have never tried with roasted cashews, but they might work as well. Hi there....it says 1 cup of water in the recipe. Is that the water used in soaking the nuts or add with the rest of ingredients?